A large number of military, police, paramilitary and civil officials were present during the wreath-laying ceremony. Srinagar, Nov 30: Army on Wednesday resumed combing operation inside one of their camps at Nagrota in Jammu which was attacked by heavily armed militants yesterday. “The combing operation was resumed early today morning,” army’s northern command spokesman Colonel N N Joshi told Express. He said the combing operation was going on. 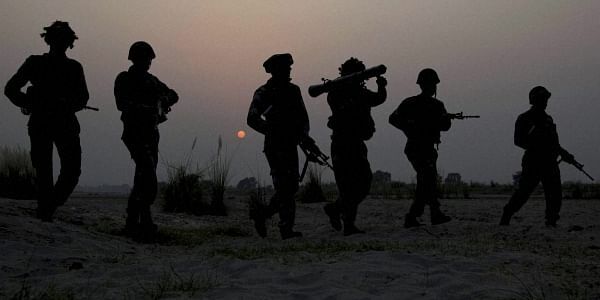 Sources said the army is conducting combing operation to ensure that none of the militants involved in yesterday’ attack on the army camp is hiding inside and all of them have been killed. “There has been no militant firing since 5 pm yesterday. It clearly indicates that only three militants were involved in the attack and all of them have been killed,” they said. Sources, however, said army is not taking any chances and conducting extensive search and combing operation in the camp. “The combing operation is also going on outside the camp,” they said. Another army official said blinds (unexploded shells) were destroyed at the encounter site by bomb disposal team during the combing operations. He said extensive searches are being carried out inside the camp. “The troops are conducting thorough searches at isolated places and near bushes to ensure that militants are not hiding there”. Guru was convicted for parliament attack and hanged in a Delhi’s Tihar Jail in February 2013. Joshi, however, said he does not have any information about the recovery of such an item. Corps headquarters, early yesterday morning. In the day-long gunfight, seven soldiers including two Majors and three militants were killed. During the operation, army’s elite para commandos were air dropped in the camp to assist the soldiers in flushing out the militants. The slain soldiers were identified as Major Gosavi Kunal Mannadir, 33, of Village Pandharpur, Distt Solapur, Maharashtra; Major Akshay Girish Kumar, 31, of Koramangala, Bengaluru, Karnataka; Havaldar Sukhraj Singh, 32, of Village Maan Nagar, District Gurdaspur, Punjab; Lance Naik Kadam Sambhaji Yeshwantro, 32, of Village Janapuri, Loha, Nanded, Maharashtra; Grenadier Raghvendra Singh, 28, of Village Gadijatar, District Dholpur, Rajasthan; Rifleman Asim Rai, 32, of village Ratanchha, Khotang, Nepal and Naik Chittranjan Debbarma, 37, of village Garingpara, Bada Maidan Bazaar, West Tripura district, Tripura. Army Chief Gen Dalbir Singh Suhag visited 16 Corps headquarters at Nagrota today and was briefed about yesterday's militant attack by senior army officers, an army official said. He said the army chief reviewed the security situation after the militant attack and directed men to increase the security and be vigilant to thwart any militant strikes. Later, General Dalbir Singh laid the wreath on mortal remains of the slain soldiers and paid tributes to them. J&K Chief Minister, Mufti also laid the wreath and paid homage to the slain soldiers. She expressed her solidarity with the families of the slain soldiers and prayed for peace to the departed souls. In a related development, Governor N N Vohra expressed serious concern about repeated militant attacks on security forces establishment and Pakistan’s continuing attempts to exacerbate the situation. review the security of all important installations and establishments.